2016 is described as the most unpredictable year for the healthcare industry by most of the experts. 2018 will see some kind of stability according to the latest healthcare trends and predictions. We can rely on the healthcare predictions to give us a clear idea on what are the elements we need to plan for. Businesses can closely analyze these market trends, expectations and preferences of staff, managers, and customers and prepare for things to come. Most of the industries are sensitive to the market trends and predictions and healthcare industry proves to be no different. 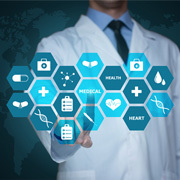 Healthcare organizations need to always stay updated with latest changes and regulatory updates and be able to serve their clients with the latest methods and techniques. To help such organizations we have listed some of the top healthcare trends and latest healthcare predictions for 2018 and beyond. World Health Organization (WHO) predicts that there will be a staggering 57% increase in chronic diseases by the year 2020. Developing and emerging markets will be affected the most due to this. Chronic disease treatments are usually expensive. The population will continue to grow and put a constant pressure on the healthcare systems due to chronic diseases. The proliferation of newer devices and technologies in the healthcare industry is slowly changing the way industry functions. New and emerging technologies such as wearable tracking devices, increased data demands, patient-centered care, and increased data security have all contributed to this massive change. This technological explosion will continue to have an impact on the industry in 2018 and the coming years. Private healthcare organizations, as well as government facilities, will continue to face funding and skilled resource shortage problems in the coming year. Attempts are being continuously made in the industry to introduce newer business models which will help in overcoming these problems. Public-private partnerships will continue to be an option which will provide long-term cost benefits and achieve high-quality standards. More and more consumers are showing a lack of interest in the care provided by traditional healthcare systems. Consumers have slowly started moving towards non-health sectors and the main driving factor for this change is easy availability of technologies. Healthcare providers are now pressurized to provide high-quality services and maintain the consumer's trust. Catering to customer's needs has not been associated with the healthcare industry in the past. In 2016, the healthcare industry has seen a lot of instances of data breach and an increase in the targeting of HIPAA business associates. Internet of Things has further increased the vulnerability of healthcare systems to data breaches and cyber-attacks. Healthcare industry is predicted to be a top target for cyber-attacks in the future. Companies will see to invest more in IT security in 2018 than ever before and a demand for chief information security officers will soar. The healthcare industry has been on the slower side when it comes to the adoption of cloud-based systems as compared to other industries. In the coming year more and more healthcare providers will choose to adopt cloud-based systems after taking care of data backup, virtualization and archiving. Along with the digital transformation of the healthcare industry, cloud-based systems will become the default model to be used for new technology solutions and platforms. The customer expectations and demands are increasing with every passing day. Consumers today are becoming more informed with the help of technologies available around them. These customer demands are allowing the entry of new players in the healthcare service providers' domain. This healthy competition in the market is forcing organizations to provide more patient-centric care and customized solutions to each patient. Healthcare organizations need to plan and integrate this new concept and create a sustainable business model in the industry. Outsource2india has always been in the forefront of providing new and trendy healthcare solutions to clients across the globe for over 20 years now. We understand that the healthcare industry has been continually changing with time and newer tools and technologies are rapidly taking over the old ones, and are committed to providing solutions compliant to these emerging technologies. Our cost-effective healthcare outsourcing services help healthcare organizations provide quality and accurate healthcare solutions, reduce the overhead costs, and provide their customers with a great experience. Our team of healthcare specialists is always on their toes and stays updated with the latest trends in the industry and implements those in our services. If you are looking for a reliable, accurate and at the same time a cost-effective healthcare service provider, look no further. Fill up the contact form or talk to one of our representatives and we will get back to you within 24 hours.